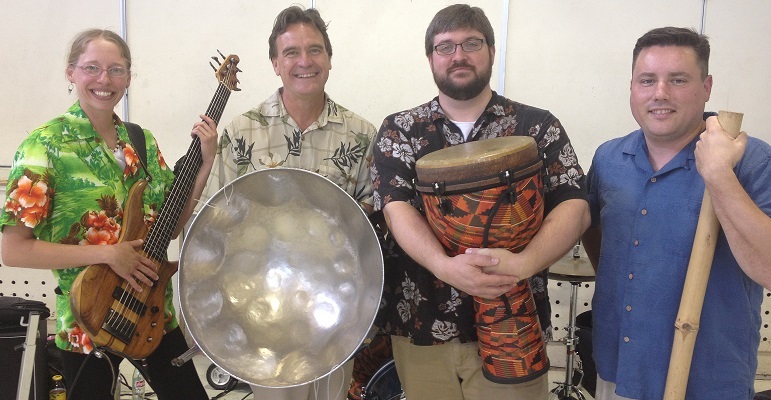 Found Sounds is led by percussionist Matt Dudack, who has been performing music for steelpan for over 15 years as artistic director of the University of Akron Steel Drum Band. Many members of Found Sounds have travelled first-hand to Trinidad and Tobago and have participated in the 100-plus member steelbands which perform during Carnival celebrations. Matt has also composed and arranged many pieces for steelband and has created one of the first method books for steelpan. A recent PBS/DVD documentary entitled, “Hammer on Steel,” which Matt co-produced, was nominated for eight Emmy awards. The main mission of the Found Sounds Steelband is to shine a light on the amazing people of Trinidad and Tobago; those who gave the world the magical sound of the steelpan!